David B. Wiens, pastor and radio missionary, was born 7 November 1908 in Friedensdorf, Molotschna. He died 25 February 1981 in Vancouver. David's parents, Bernhard B. Wiens and Elizabeth (Enns), his second wife, had eight children of whom David was the third. David's brother, Peter B. Wiens, was the well-known editor of Der Bote. In 1924 David left Russia for Canada with his parents and siblings, temporarily residing in Rosthern, Saskatchewan, then in Herschel and finally settling in East Coulee, Alberta. David grew up in a Christian family and at age ten made a commitment to Christ. In 1933, at age 25, he experienced a life-changing spiritual renewal under the ministry of Howard Phillips. David was baptized in 1934 in the Drumheller Baptist Church by Rev. H. Klassen and joined the Evangelical Mennonite Brethren Church in Namaka, Alberta. Hearing the call of the Lord on his life, he entered Hepburn (now Bethany) Bible School in 1935, where he spent two years studying. There he met Gertrude Janz, daughter of the well-known minister, B. B. Janz. Beginning in 1937, he studied for two years at Western Baptist College in Calgary, Alberta. On 28 October 1939 he married Gertrude, who faithfully supported him in his various ministries for 39 years, until her death in 1978. They had four children: Paul, Viola, Victor and Edith. In 1979 David married Mary Toews, the organist at Culloden Mennonite Brethren (MB) Church. After teaching at Hepburn for three years, David felt called to minister among Russian-speaking people around Arelee, Saskatchewan, a wonderful preparation for his later radio ministry to the Soviet Union. During 1942 and 1943 he also served as chaplain to conscientious objectors in Alberta and Saskatchewan. His ordination in 1944 took place in Hepburn, Saskatchewan. Five years later he accepted his first pastorate in Laird, Saskatchewan. In 1951 he resigned from his church duties to work in the Western Children's Mission, becoming its director in 1952. Three years later he accepted a call to pastor the Neuwied MB Church in Germany. One of the central interests of David's life was the Russian radio ministry, which began in 1957 and continued until he died in 1981. Twice (1956 and 1960) he was privileged to visit the Soviet Union although not without harassment and surveillance by the authorities. 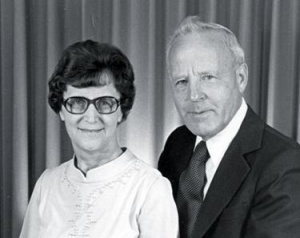 However, D. B. Wiens will perhaps best be remembered for his long pastorate at the Vancouver Mennonite Brethren Church where he commenced ministry on 21 July 1957. Eleven years later (1968) the congregation planted a new congregation, Culloden MB Church, which he pastored until 1975. David was a gifted speaker, fluent in three languages: Russian, German and English. Since he was blessed with an exceptional memory, he seldom preached from notes although he typed out all his sermons. He was a man of integrity, discipline and deep conviction. He never neglected to request forgiveness when he felt that he had wronged someone. David served the Canadian MB Conference in numerous ways, notably on the Board of Spiritual and Social Concerns. His strong insistence on the authority of Scripture gave him the courage to dissent on issues when his convictions did not permit agreement with majority thinking. In his book Ein Leben fuer den Herrn, Erich Ratzlaff notes, "D. B. Wiens was a man who had experienced the grace of God in his life which enabled him to scale the wall of even the Iron Curtain." Many people in Canada and beyond found Christ through his ministry. Ratzlaff, Erich. D. B. Wiens, Ein Leben Fuer den Herrn. Winnipeg, MB: Mennonite Brethren Historical Committee, 1982. Fast, Ed. "Wiens, David B. (1908-1981)." Global Anabaptist Mennonite Encyclopedia Online. November 2009. Web. 20 Apr 2019. http://gameo.org/index.php?title=Wiens,_David_B._(1908-1981)&oldid=136138. Fast, Ed. (November 2009). Wiens, David B. (1908-1981). Global Anabaptist Mennonite Encyclopedia Online. Retrieved 20 April 2019, from http://gameo.org/index.php?title=Wiens,_David_B._(1908-1981)&oldid=136138. This page was last modified on 3 October 2016, at 18:15.